Walking or driving through downtown Raleigh’s Fayetteville Street, you will pass through the business district. Fayetteville Street is tree lined with many benches and tables, giving you an opportunity to relax and enjoy the diversity that has attracted many businesses and residents to call Raleigh, North Carolina their headquarters and home. If, by chance, you are a resident of the greater Triangle Area, you are aware of a myriad of festivals and events that use the Raleigh Downtown district as their backdrop. These events attract thousands of participants from around the state, as well as from around the country. There are several activities to participate in on any given weekend. Once you decide what peaks your interest you can avoid the parking hassles by taking Uber. For Triangle Street Eats, our vice happens to be food trucks. 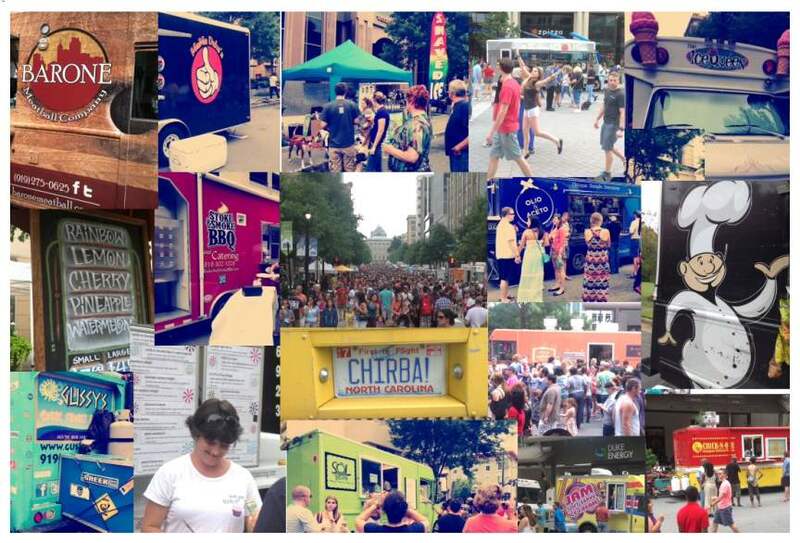 We have found the Downtown Raleigh Food Truck Rodeo with its energetic atmosphere and numerous food trucks offering diverse flavors to be an event worth attending, again and again. Attendees are often left to navigate a labyrinth of food trucks and crowds, in order to sample the wonderful fare offered by nearly 50 venders. There are locally crafted beers that can be sampled as well. When you see how the Downtown District is used as a backdrop for this event, you will understand why this event is so popular. If you haven’t had an opportunity to participate in a Downtown Raleigh Food Truck Rodeo, and have been meaning to, you have one more opportunity to do so this year on Sunday, October 12, from 1pm – 6pm. As is typical for larger events, The Friends started to form a plan-of-action a week or so in advance. Since we have sampled fare from many of the food truck participants, we tried very diligently to sample from those we hadn’t tried yet, as well as from a few tried and true. Below you will find the results of our effort, as well as their links. It is important to appreciate some of what we sampled was specifically offered for the Downtown Raleigh Food Truck Rodeo attendees, as is not necessarily part of their regular menu. From Virgil’s Jamaica, the Belle and I had sampled the Jerked Chicken before. I enjoyed this flavorful island dish, and asked the Traveler to try it for herself. She said that it was moist and to her liking, but could have used more heat. From King Creole, we had the blackened pork chop, which again the Belle and myself had sampled at the 2nd Food Truck Rodeo, but the Traveler had not. She commented that it was wonderful in both taste and portion size. She will definitely repeat. From Hanu Food Truck we sampled the B.S. (Brussel sprouts). They were incredible with a creative medley of flavors. Look forward to having these again, since none of us eat enough greens. We also sampled their duck dumplings, which were delight flavorful, and the dipping sauce was sweet and tangy. Dank Burrito Truck offered jerk chicken tacos, which was one of my favorites of the event. The Traveler commented that it was spicy and great tasting. She loved the moistness of the chicken and would definitely eat it again. A glowing review if ever there was one. We sampled the truffle mac bites from Olio & Aceto before, and had them again at the Raleigh Downtown Food Truck Rodeo. As they were previously, they were to our collective liking and would recommend them to anyone looking for gooey goodness. From Mama Dukes, we sampled their breaded shrimp. They were tasty but would have preferred more shrimp and less fries and salad. $10 for only 5 shrimp is over-priced. From Barone Meatball we sampled the crab balls. We collectively determined that they had too much filler, and seemed slightly undercooked. From American Meltdown, one of most popular food truck in the Triangle, we sampled their Pigs & Figs. It is no wonder that this is one of their more popular sandwiches – very sweet, smooth and moist. From Gussy’s Greeks, we sampled Greek Lasagna and gyro. The lasagna was not spicy enough. The béchamel sauce was light and fluffy, but lacked flavor. The gyro, on the other hand was very good, loved the meat and sauce. The sheer amount of food that can be sampled at one of these events can be overwhelming. Try as we did, it was impossible to taste more than we did, even when we paced ourselves. One thing is certain, to experience one of these events first-hand is a must if you want to get a feel for the extraordinary phenomena culture surrounding food trucks, and all things related, like this blog. Stay hungry my friends!